In the Name of Love: Episode 41 | TeleNovela Channel - Bringing you closer to lifes drama. Rafael gives Diana the divorce papers while Camila, Orlando, Macarena and Rodolfo go out for a double-date. 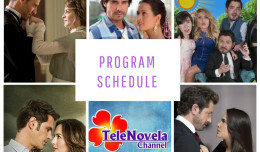 Meantime, Orlando runs into Diana whom he calls Gudelia, while Romina overdoses herself to try to blackmail Emiliano and force him to marry her.